Vonnegut wrote a children's book about the first hours after Christ's birth - am I the only one who had no idea this existed? It's kind of amazing. Vonnegut had the illustrator, Ivan Chermayeff come up with the illustrations first, and then wrote the story around the pictures. It's all done in a very simple style and tells the story of what Jesus saw during the hours after his birth. The concept is great, and, obviously, it's by Vonnegut so the writing is amazing. 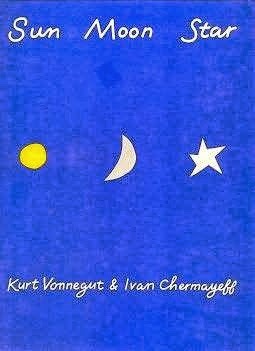 While the subject matter is definitely a departure from his adult works, the writing style is immediately recognizable as Vonnegut's. I loved that the style is so consistent with who he is as an author, despite the fact that he's writing for a younger audience. This is definitely one that I'm going to be on the lookout for to purchase to read to my favorite boy and girl this Christmas. From what I can tell, it's still very difficult to find in print, but has been re-released as a Kindle book and is available for a very reasonable price. I also managed to find this link to a YouTube video of Vonnegut reading the book himself that is definitely worth checking out. Thanks to Edelweiss for providing me with a copy to review.